Most image restoration techniques build "universal" image priors, trained on a variety of scenes, which can guide the restoration of any image. But what if we have more specific training examples, e.g. sharp images of similar scenes? Surprisingly, state-of-the-art image priors don't seem to benefit from from context-specific training examples. 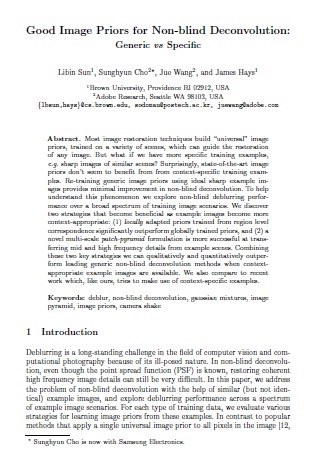 Re-training generic image priors using ideal sharp example images provides minimal improvement in non-blind deconvolution. To help understand this phenomenon we explore non-blind deblurring performance over a broad spectrum of training image scenarios. We discover two strategies that become beneficial as example images become more context-appropriate: (1) locally adapted priors trained from region level correspondence significantly outperform globally trained priors, and (2) a novel multi-scale patch-pyramid formulation is more successful at transferring mid and high frequency details from example scenes. Combining these two key strategies we can qualitatively and quantitatively outperform leading generic non-blind deconvolution methods when context-appropriate example images are available. We also compare to recent work which, like ours, tries to make use of context-specific examples. Libin Sun, Sunghyun Cho, Jue Wang, James Hays. Good Image Priors for Non-blind Deconvolution: Generic vs Specific. Proceedings of the European Conference on Computer Vision (ECCV), 2014. 8. HaCohen et al (2013): blind deconvolution, estimated kernel shown in top-left. 9. Ours: non-blind deconvolution, using kernel estimates from 8.